The hanglider feels natural and is a very welcome addition to the series! My brother and I have always been really big Mario Kart fans. I doubt either of us can even calculate the many hours battling and racing against one another, friends, and family. So it is fairly obvious that we would immediately pick up the latest iteration of the series, especially since its multiplayer functionality allows us to play over great distances. Mario Kart 7 adds some great things to the series without having taken much away. 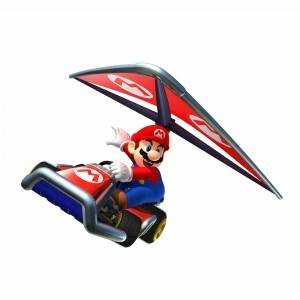 Probably one of the biggest additions is the glider that karts can deploy. When you launch yourself over certain ramps your kart automatically deploys a glider, allowing you to pitch up or dive down, gliding over certain obstacles or making your way to specific shortcuts. The mechanic sounds kind of gimmicky, but it actually works out quite well. It is not overused and actually allows for some interesting options while racing. I was actually surprised by how much I liked it and I hope it makes its way into future entries in the series. The other new kart feature is its ability to drive underwater. A small propeller pops out the back and you can zoom across the ground underwater. Too be honest, I dont really find this to be that big of a deal. 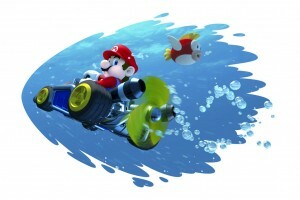 Some players are put off by it because you do move slower underwater and it slows down the pace of the game. You can also find three new items in Mario Kart 7: Fire Flower to shoot fireballs, Super Leaf to have a Tanooki tail swing around you, and Lucky 7 which gives you all sorts of items to use at once..
Mario Kart 7 has the standard 4 cup setup, with each cup having 4 courses. I actually really like the tracks in this game and I am really happy by the increased amount of shortcuts, which seemed to be really lacking in Mario Kart Wii. Also this incarnation of Rainbow Road is one of my favorites. In addition to the new courses are four cups containing retro courses from other Mario Kart games, so hopefully among them you can find an old favorite or two. Above all, Keen and I love the battle mode, which in this version comes in coin battle and balloon battle. Coin battle has you collecting coins and stealing them from one another while balloon battle has you hurling weapons at each other, trying to knock balloons off your enemies. It seems to be pretty standard fare. I believe there are 6 arenas, three new and three old. Unfortunately I am not such a fan of the older stages and I only really like one or two of the new ones. Why they left out Block Fort is beyond me. As for the 3D effect, I guess that really depends on who you ask. I think it adds a nice level of depth without shoving a lot of crap out at you.The 3D is not utilized in as good a way as it was in Mario 3D Land, but it gets the job done. Turn it off or keep it on, the game still looks fantastic. The game does not just use the 3D capabilities of the 3DS. If you choose, you can enter into a first-person kart mode and use the gyro controls to steer your kart. I was actually surprised by how well it worked after I got the hang out it. It is a fun way to drive from time to time, but I definitely feel I have more control when using the circle pad. Still, it is a nice addition. So really if you love Mario Kart then you should get Mario Kart 7. It is just really good and probably one of the better versions. The game also features online multiplayer, which actually functions really well. You can play with 7 other players from around the world, battling and racing. You can even create specific communities to play with. I went ahead and made a K&G Community in case anyone is interested I can post the code. Now go buy the game and a 3DS if you dont have one, I have to go unlock more characters. I’m pretty much buying a 3DS just for this. I was just about able to resist when zelda and mario 3D land were released but this is pretty much strike three for me. I’ve given in!